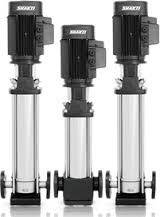 We are successfully engaged in offering a commendable array of Vertical Inline Multistage Pumps. The offered product is precisely manufactured using superior quality raw material and advanced machinery in adherence to the set industrial standards. The product offered by us is highly appreciated by our clients for its smooth finish and high durability. Clients can avail the offered product from us in various customized options at competitive prices. Tungsten carbide Motor Support, Foundation base: cast iron. Looking for “Multistage Vertical Pump”?